Our ceremony will take place outdoors on the Quadrangle in the center of the Hall Campus. Please plan and let your guests know to plan accordingly. Lanier Technical College is a tobacco free campus. Restrooms will be available in adjoining buildings. Guests should arrive between 8:00AM and 8:50AM. No one will be seated before or after those times. The ceremony will be held as planned even in rainy conditions; however, in the case of sustained downpour or severe weather when the outdoor ceremony must be cancelled for safety, a more condensed ceremony will be held the following Friday (May 24th) in the Ramsey Conference Center at the Hall Campus at 9:00AM. Depending on the number of graduates participating, the number of guests may be limited in the case of this event. Associate of Applied Science Degree, Diploma, and Technical Certificate of Credit students who complete their programs during Summer Semester 2018, Fall Semester 2018, or Spring Semester 2019 are eligible to participate. How do I register to participate in the ceremony and what is the deadline? Graduates can register online by visiting the Apply for Graduation page. The deadline to register for this year’s Commencement Ceremony is March 1, 2019. An Application for Graduation must be completed by each potential graduate. See academic calendar for deadlines for each semester. Students should apply for graduation when they register for their anticipated last semester. This allows the Registrar’s Office time to process the request and notify the student of the results via email. The student must register to participate in the Commencement Ceremony between January 1 and March 1, 2019. The student must pay the $40 Graduation Fee by March 1st. After the graduation fee is paid, the student will be emailed a link to order their cap and gown through Oak Hall. There is no cost to submit this order. Regalia will be delivered to Lanier Technical College campuses. Pick up will be at the campus the student selects between April 24 and May 10. What does the $40 Graduation Fee cover? The Graduation Fee helps cover the cost of the student cap, gown, and tassel, as well as extra expenses incurred for the ceremony. The actual cost exceeds $40. Additional funding for the Commencement Ceremony is provided by the Student Government Association and the Student Activity Fees you pay each semester. When is the $40 Graduation Fee due? The Graduation Fee is due no later than March 1, 2019. This will ensure that the graduate’s cap and gown order can be placed and received in time for the ceremony. Payments can be made in BannerWeb, at any of our campuses, or by phone with the Business Office at 770-533-6909. Graduates must have received confirmation that their registration form was received before they can pay the Graduation Fee. Do I need to attend rehearsal? Because Commencement is held in the morning, we do not have a scheduled rehearsal. We ask that all graduates arrive promptly at 7:30AM on May 17th to allow time to prepare for the ceremony. How do I get information about Class Rings, Personalized Graduation Announcements, Graduation Accessories, and Collegiate Frames? Will there be professional photos taken during Commencement? 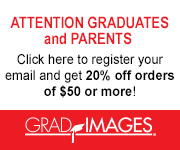 GradImages is the official commencement photographer for our school. Your complimentary proofs will be ready to view online as soon as 48 hours after the ceremony. In order to notify you when your images are available, GradImages sends emails and mails paper proofs, along with optional text message notifications. Pre-registering is a way to make sure your contact information is up-to-date with GradImages, so they can provide your proofs as quickly as possible. To pre-register for your commencement proofs, please visit http://www.gradimages.com/Preregistration. What type of notification will graduates receive? Students who are eligible to participate in the ceremony will be contacted by both student email and the personal email on record with information and a link to the registration form. A reminder postcard is scheduled for mailing at the beginning of April. This postcard will include the schedule and locations for cap and gown pick-up. Do you need special accommodations or assistance to participate in the ceremony? Do you have a guest who may need special accommodations? Individuals with disabilities requiring assistance or accommodation to participate in or attend the Commencement Ceremony should contact Allison Haynes at 770-533-7003 or ahaynes@laniertech.edu no later than Wednesday, May 1, 2019. Graduation is a very special time. We encourage you to enjoy your accomplishment, reflect on the time spent pursuing your degree, diploma or certificate, but look forward to the exciting future of endless possibilities. Graduation is not the end of your journey…..it’s only the beginning!